Due to security reasons and increasing need for privacy even when on the internet. A VPN is very essential tool to make you anonymously surf the internet while completely hiding under a different location. Although there are many VPN apps to available that you can use on your Android device, the only problem is that most of them actually charges you to make use of their App. 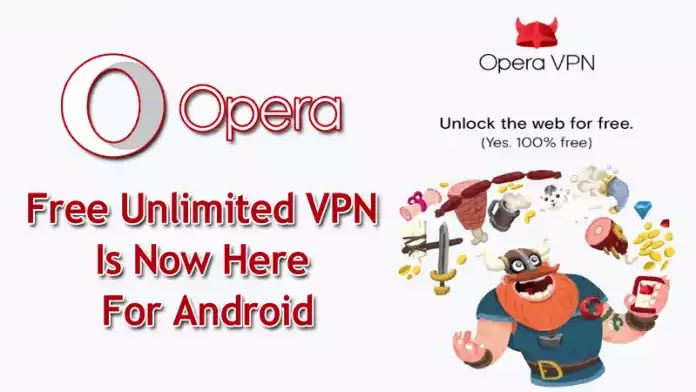 And that is one of the major reason why the new Opera VPN stands out as it offers you the VPN service without any charges. After previously releasing the VPN tool on PC and iOS platform, Opera has finally decided to introduce their VPN app on the Android platform. Aside given you that online security, the VPN app also gives you added protection when using a public Wi-Fi and it also has a built in ad tracking blocker which helps prevent advertising networks from tracking your behavior online. We also can't go without mentioning how easy it is to setup this app as the process is so fully automated and needs almost no user intervention. As most of you already know, VPN apps are used to spoof internet users location and this VPN app currently offers 5 different locations which are USA, Canada, Germany, Singapore, and The Netherlands with more to come soon. Although Opera is offering a completely free service without a data limit, no login required, advanced WiFi protection features and no need for a subscription. We most also note that Opera needs to generate income some how and that is where the ads come in. So even though the opera VPN is going to help you block ads for other apps, you must also note that this free app also comes with its own ads. The app is currently available for all Android users and you can get it on play store.